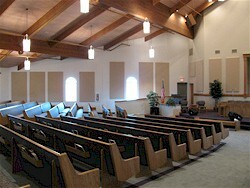 Your one-stop source for church or theatrical lighting control systems and fixtures. 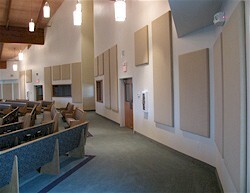 Phillips Pro Systems has solutions for difficult acoustical environments. Eliminating and reducing echo, flutter, and reverberation for smooth, intelligible sound quality. Using EASE computer simulation, we will provide the architect, or you the facility, accurate information for sound decision making. Establishing budgets in the design phase and following through the construction phase, Phillips Pro Systems is your experienced leader for acoustical solutions. Eliminating and reducing echo, flutter, and reverberation for smooth, intelligible sound quality. Using EASE computer simulation, we will provide the architect, or you the facility, accurate information for sound decision making. Establishing budgets in the design phase and following through the construction phase, Phillips Pro Systems is your experienced leader for acoustical solutions. The new Acoustics 180° Diffsorber is the most sound absorbing product available anywhere. This panel’s proven overall and low-end diffusive and absorptive characteristics make it the best choice for treating sanctuaries, performing arts centers, and many other types of facilities. Available in absorbers, diffusers, and reflectors to custom tune your room. The Wedge™ panel series is a top performer in the mid to high frequency range. Its unique patented shape was designed to add diffusion to absorption. This panel’s proven diffusive characteristics make it the natural choice for treating small to medium size rooms such as studios, home theaters and houses of worship. Available in 2’ widths only. Custom sizes available up to 8’ (i.e., 2’ x 6.5’). The Mega-Wedge™ panel takes the top performing characteristics of our Wedge™ panel and then adds thickness and mass to provide extra low frequency absorption. This product is best suited for facilities where space is limited but low frequency absorption is required. The Econo-Wedge™ panels take the Wedge™ slope of 1 1/2″ to 3 1/2″ and spreads it across a 4′ panel instead of a 2′ panel. This creates a much more economical price point, when compared to the price of using two Wedge™ panels to achieve equal size. Available in 4’ widths only. Custom sizes available up to 8’ (i.e., 4’ x 6.5’). Perdue Acoustics patented flat panel series is the industry’s leader in the area of sound absorption coefficients, boasting unequalled NRC’s. All flat panels can be customized with different edge details. Choices include standard square edge or PVC hardened edge with radius, beveled, or square shapes. 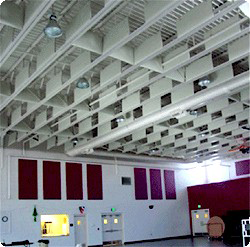 Utilizing the same cores as in our “best in the business” flat panels, our hanging sound baffles provide excellent absorption in the upper ceiling areas of your facility. With twice the surface absorption area, you will achieve unprecedented performance with these baffles. Let our panels go to work for you today!